“I owe my soul to the company store” was just a line from the song “Sixteen Tons” that I used to hear as a kid. It was a great country song sung by Tennessee Ernie Ford with his rich smooth baritone. (If you are too young to know this song, stop a listen to this YouTube clip.). Living in suburban California, I had no idea about coal miners other than the work was hard, dirty, poorly paid and claustrophobic, not to mention dangerous. Coal miner was never on my list of possible careers. Then I met Abbie Michalik in Glace Bay, Novia Scotia. It happened on my latest vacation. Not wanting the usual offering of excursions to see the “highlights” from the bus window, we hired a cab for a trip to the Cape Breton Coal Mine Museum. More than just a museum of the Glace Bay history of coal mining, it promised a tour to the now closed mine led by a former miner. There is a downside to not taking organized cruise shore excursions and one of those is arriving to find there are no tours! It turns out we were two days before the official start of the tour season, and though the museum was open, no tours were offered. Fortunately the museum staff did not want to disappoint any visitors and managed to reach one of the former miners at home mowing his lawn. Sure, he could come right down. Abbie showed up about 15 minutes later. A spry 75 year old, he started in the mines as a child and worked there for 20 years. After he quit working the mines, he went back to school so he could pass the exam to be a tour guide in the mines, and he has been doing this for many years. 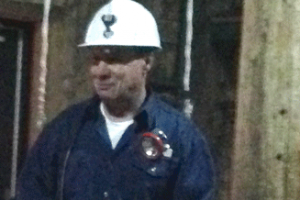 He got us into our tour gear—protective capes and hard hats— and off we went down into the cold, damp and dark mine. And he began the story of his life as a miner. His dad was a Czech immigrant who left the old country for a better life. Some better life! Twelve hours a day in the mine, leaving home in the dark, working in the dark, and often going back home in the dark. Hard, back breaking work of chipping coal out of the walls by hand and hauling it up to be weighed and recorded. Abbie talked about his father and six uncles who all worked the mine. He talked about the family (10 kids!) who lived in a house they made out of salvaged wood from “decommissioned” outhouses and their struggle to just survive as well as fight for better pay and better working conditions. At the time, miners were required to pay for all their own work clothes, safety equipment (such as it was), tools, blasting powder, timbers to support the mine roof as they worked, even to pay for a tally master’s salary so they knew they were getting accurate weights recorded. All from their meager earnings of 70 cents a ton of coal, assuming the coal cart didn’t overturn on its way up, the ID tag didn’t fall off, an unscrupulous miner didn’t replace your ID tag with his, or the inspector didn’t determined there was too much rock in your cart. His story is one of terrible hardship, poverty and struggle. But it is also the story of a man with strong values and a good heart. His father and six uncles died in either mine accidents or from black lung disease. But he doesn’t look back with bitterness. He savors each day and is proud that his hard work has meant his children never worked the mine, but are now all college graduates and working professionals. Listening to Abbie tell his mining stories, I realized what an inspiration he could be for any small business owner turning storyteller. Here are five lessons from Abbie. Abbie is a great storyteller, but not a polished one from years of drama lessons, writing courses or stage experience. He is great because he has a message he wants to tell and a story he has lived. He speaks from the heart and you find yourself laughing at one of his jokes one minute and crying from the heartbreaking life of a coal miner the next. His stories are not great because of presentation but because of authenticity. Abbie didn’t waste much time on coal facts, like chemical composition, or tons per year or how many men worked the mine and for how long. Instead he focused on the details that would be meaningful to us. Showing us the coal cart and how you could get 70 cents for filling it. Or how to start cutting a new seam. He enjoyed turning off the limited lighting so we could really experience the dark, damp conditions as a miner would have. He walked us through the process of identifying a seam, using the pneumatic drill to cut in a room (miners worked rooms of coal, with roofs held up by timbers). He showed us the coal cart that was used to get miners down into the lower parts of the mine and told a story of the day the rope broke on the cart. Thanks to his father’s quick warning, Abbie jumped to safety, but his cousin was caught under the wheels of the runaway cart and killed. Abbie knew instinctively that people can get facts anywhere but also people don’t care about facts. What they need are connections to the story. We can read about the “life of the coal miner” but there is nothing so real as a person telling you his story, using details we can all relate to. While telling the story of the miner, Abbie always returns to his message the reason he is doing tours: nations have become rich and powerful through industrialization. But this industrialization was built on the backs of poor, uneducated and mostly immigrant labor. Monuments are built to people like Andrew Carnegie and Robert Dunsmuir, but the lives of the thousands who toiled in the dark, damp, dangerous mines will be forgotten unless people like him continue to tell their stories. Spreading this message is why Abbie was so eager to drop his lawn mower and race down to the mine museum, a new group of tourists was waiting for him. What were we thinking in taking this tour? Some were out just for the thrill of the dark, cramp quarters. Others were apprehensive about the whole idea. What did we know about coal mining? How many of us have ever met a coal miner? What did we really want to learn? Most people on a tour like this know very little about the subject and are just here for the experience. I suspect most came for the thrill of being down in a coal mine and if the tour had been just a talk by a coal miner without the mine experience, the turnout may not have been as great. Abbie made the most of the coal mine setting. But he knew how to turn our interest in the mine into a learning experience about the miners. We might have started the tour eager to see what a coal mine is really like; but his stories ensured that we all left with a new appreciation for the miner. It was clear that Abbie had a great sense of humor. He used humor to break the tension and to introduce the human aspect of coal mining. If you want to hear a bit of Abbie, you can watch this YouTube clip. It can be difficult to understand due to the quality of the recording and Abbie’s accent. The punch line is right at the end. Abbie gave small coal samples to each of us on the tour. I have my piece on my desk now. It will be a reminder to me of the storytelling lessons from this coal miner. So what about your business storytelling? Are you telling your stories authentically? A listener can spot a constructed story, told for marketing purposes from an authentic one. Never cross the line. Be yourself and tell your story. People buy not because of what you do but because of why you do it. Do you start your story with elements that are familiar to the listener? One rule of thumb I have heard is 80% familiar and 20% new is the right recipe for a story. If you have too much that is unfamiliar, especially at the beginning, the listener cannot make sense of the story and will not pay attention. Once you have lost their attention, you will never get it back. Always know the marketing message you are trying to communicate and use the story to drive it. Do not wander off the topic or try to do too much with a story. With multiple messages in a story, you can’t control which one is remembered. Where in the buying cycle is the listener? How familiar is he with what you are selling? You will need a different story for someone who is looking for a particular solution and you are trying to get his attention that you have a different solution that he has never heard about. Once the prospect is further along in the buying process, you will need stories that overcome potential buying obstacles or success stories that confirm you are the right choice. People are more relaxed when they are laughing. Humor can break through skepticism and tension and build bridges between the speaker and the listener. This does not mean you start telling jokes. Subtle humor can be very effective. Looks for ways to add an unusual twist or lighthearted language. Often the best humor comes out naturally when you are yourself and speaking from the heart.